Videos are a great way to communicate your thoughts, even better than text. And to put our thoughts in an even understandable manner, we usually need to trim, cut or edit our video in one way or another. Joyoshare Media Cutter Software is one excellent tool that helps us do just this easily. It’s not just a video cutter, but works as an audio trimmer as well. Let’s look at this excellent video editing tool in more detail. This media cutter program has a simple interface and clear, direct options to help you easily select which part of the video you would like to keep, and which you would like to cut away. You can either manually input starting and ending time of each segment, or select them when the video is playing by choosing the ‘Set Segment End Time’ and ‘Set Segment Start Time’ options. This way, it is easy to cut away a big chunk of a video or smaller video segments in simple and easy steps to get your desired result using this media cutter tool. Whether your input video file is HD quality or of lower, this media cutter tool maintains it throughout the trimming and merging process. After you have selected the part(s) of the video you would like to trim, it is now time to merge the remaining. Of course, you can also choose to save each segment separately. Clicking on the ‘Format’ option gives you two options: “High” and “Encoding Mode”. “High” is the recommended setting you should click on, as it is fast and with no quality loss. “Encoding Mode” is recommended to get the output file to suit a certain device. This process is slower but more customizable. You can choose between a number of devices depending on your requirement – Google Pixel, Samsung Galaxy Tab, Samsung Galaxy S8, iPad Pro, iPhone 8, iPhone X, Xbox and many more – or even make a general selection like Windows, Android, Apple, Smart TV, and PS4etc. A lot of video editors make you wait for the final file to see if you got it right. If you are trying to achieve a result by trial and error, you will end up spending a lot more time than you’d like to. Keeping this in mind, Joyoshare Media Cutter allows you to pause and play the segment you’re cutting and make changes if required. The same thing applies when cutting audio, as well. 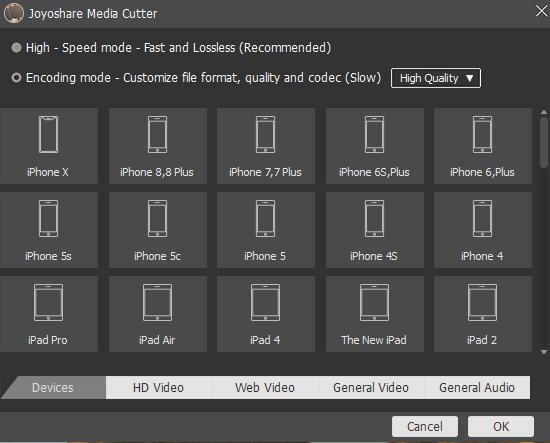 The video cutter program offers an extensive list of device presets that you can use to convert your output file into. But other than that, you can also choose general high-quality video formats like HD MKV, HD AVI, HD MP4 or popular general formats like WebM, 3GP, 4K, JPEG, MKV, AVI, MOV, MP4, WMV, 3G2, ASF, H.264, PMVB, OGV, VRO and more. Additionally, you can also change audio quality, resolution etc. If you’re just looking to convert your favorite audio to another format, Joyoshare Media Cutter has you covered. 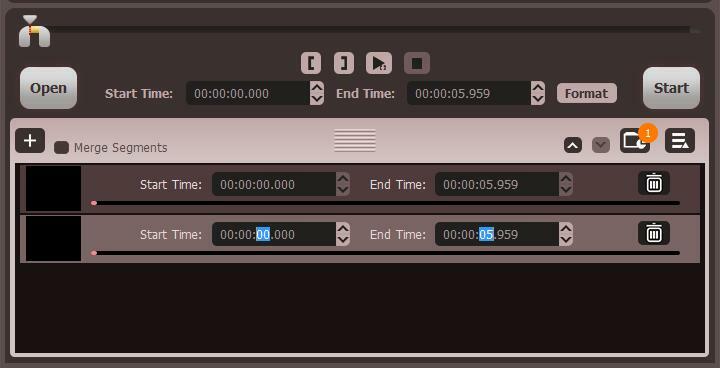 It can extract audio from a video and allows you to save it in WAV, AAC, M4A and MP3, ALAC, AU, MKA, M4R, M4B, WMA, FLAC, APE, AIFF, CAF, OGG and AC3 formats. It is thus an efficient video and audio cutter for Windows. With this Media Cutter tool, you won’t be missing out on any frame while editing by using two sets of control keys. One control key allows you to move forward or backward by a certain number of seconds depending on your video’s keyframe length. The other set of control keys moves you to the next or previous frame by 0.02 to 0.10 seconds, which means you will be seen, pause and remove even the minute details in your video. Thus it is an excellent media cutter software if you are very particular about detailing. While trimming and merging are the main features of Joyoshare , it also offers a number of smaller options to enhance your media. 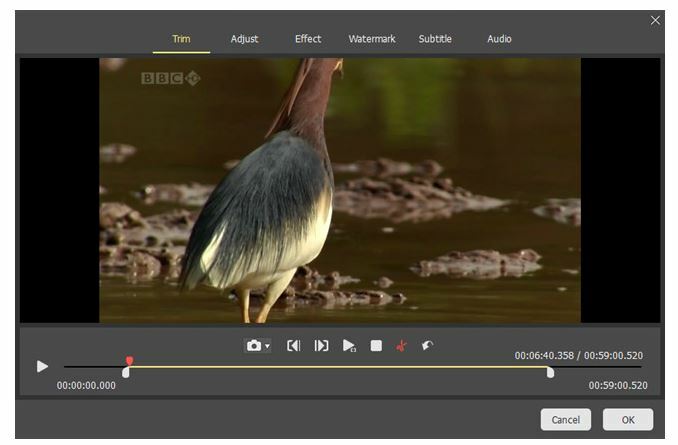 Editing features like audio, subtitle, watermark, effects and adjust are all inbuilt into this software. You can do more than just cropping, like adjusting the aspect ratio, changing the saturation, brightness or contrast and hue or even applying effects like Snowflakes, Rain, Fireworks, Blue Sea and more. You can also apply a totally different audio file to your video. 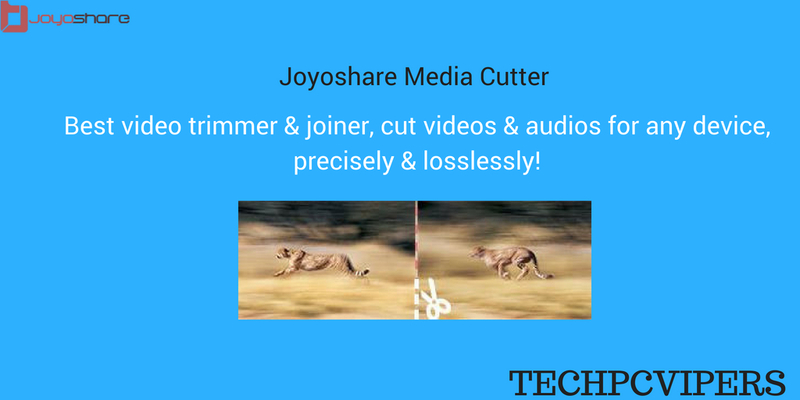 Joyoshare Media Cutter for Windows is the fastest software you can find to trim or edit your video. Right from uploading the video or audio into the software to processing your edits, the software is 60 times faster than your older video cutter program. What’s more, even at this speed, there’s no loss in quality. No direct way to get rid of an unwanted segment that is in the middle of the video. Joyoshare Media Cutter for Windows is undoubtedly the simplest yet fastest video editors in the market currently. Its top quality performance and bundle of features make video trimming an enjoyable experience. Be it wildlife videos, DIY, videos of your pet, tutorials or marriage videos, Joyoshare allows you to cut out segments without compromising on quality. If you’re looking for a video and audio cutter for windows free of cost, then download Media Cutter for Windows trial version today by clicking here. To know more about Joyshare and their other products, visit their homepage by clicking here.